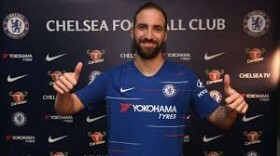 Chelsea boss Maurizio Sarri has expressed his pleasure after Gonzalo Higuain bagged his first two goals for the club during the Premier League triumph over Huddersfield Town. The Argentina international joined the Blues on a short-term loan from Juventus last month but he made an uncharacteristic start with no goals in the opening two appearances. However, he managed to make amends against the Terriers by scoring his maiden goal which was thereafter converted into a brace in the second period as the Blues romped to a comfortable 5-0 win. Speaking after the game, Sarri said that the striker is approaching match sharpness and believes the combination of Higuain and Eden Hazard will produce a lot of goals. "I think that, on the pitch, they are really very suitable to play one close to the other. For us, this is very useful for Higuain because he will be able to score a lot of goals, but also for Eden," he said via Goal.com. With the win, Chelsea have returned to the fourth position in the standings and they are unlikely to be leapfrogged unless Arsenal secure a big margin victory at Manchester City.